Are you a poet or penner of short fiction? Have any of your poems or prose ever included aliens, time travel, jelly babies, or copious amounts of running? Then have I got the Open Mic Night for you! 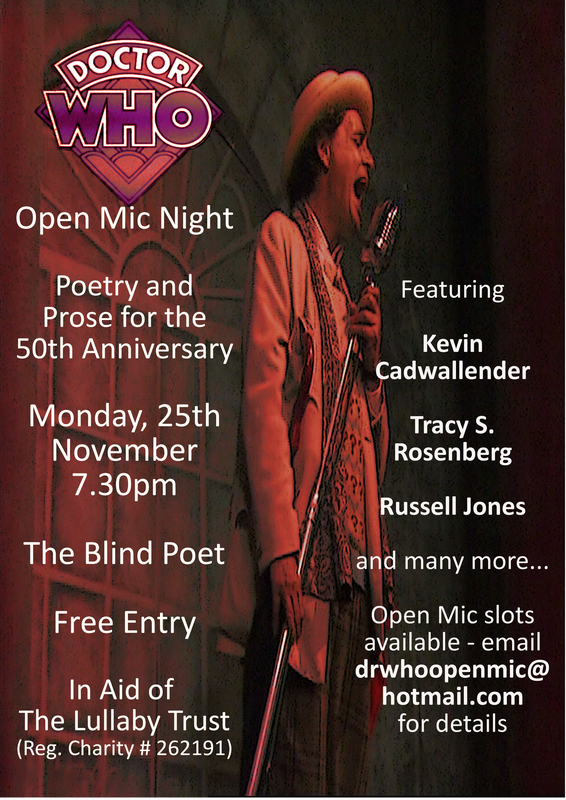 Organised by my good friend Andrew Blair and the chaps behind Blind Poetics*, the truthfully titled ‘The Doctor Who Open Mic Night’ is coming to Edinburgh pub The Blind Poet on November 25th. Join performers Kevin Cadwallender, Tracey S. Rosenberg and Russell Jones as they celebrate the Fiftieth Anniversary of Doctor Who through spoken word. And as you do it, you can help raise money for The Lullaby Trust, an amazing charity that supports bereaved families. Meanwhile, if you just want to go and have a listen, that’s likely what I’m going to do. Unless I spend the next week finally committing that Ode to Brigadier Lethbridge-Stewart I’ve been composing to paper… But I fear I’ve said too much. Anyway entry is free, although as discussed there is the option to donate to the Lullaby Trust (they are suggesting a very reasonable £2). *Those chaps are Roddy Shippin and Alec Beattie, and you can keep up with Blind Poetics, a monthly night of spoken word, on Facebook and Twitter. Aw, maybe you could organise one where you are? Thanks for sharing Ali, I’ve signed up! Haha, I have to admit I had to Google his name but I recognised him when I saw him! I’ve got something I wrote a while back that’s a bit more generally about space travel so I guess I’m at an advantage. Still need to memorise it though..